RE: "The problem that you are having is caused by the fact that the BIOS update is only compatible with Win 7. " I am using same Win 7 that came with this HP desktop....further, I manually did this at DOS command level with admin privilige since exe program failed also. RE: "HP does not provide updates for software and BIOS for any computers built before 2013." Not relevant....their update I cited has failed....someone put in inccorect bios file to be updated. While I agree WIN 10 should not have been said, your being somewhat harsh with OG. We all have our bad days. I seem to have them more frequently being subjected to browser choices. Alas, I wandered off ? What is very relevant is the original WIN 7 BIOS that was installed, (your machine was shipped with a non-UEFIvBIOS), and the fault lies with you. Your trying to re-install the same BIOS version and SSID. HP has the SNAFU, not the OP. In sincerity, and without offense, one has sidetracked the issue at hand with bogus responses. I am not a neophyte...I recently built another desktop computer using a "new" and identical motherboard, which includes the OEM BIOS/UEFI, and it too could not be flashed. Hibiscus motherboard shown here, as it does NOT support that action. As your unwilling to understand this issue, I wish you the best. I shall not comment further, as I am a volunteer. Your asking for advice on a system (circa Jan 2012) that is OUT of warranty. Thus HP should not have any interaction with you. I did my homework, and followed HP's instructions. One has not paid attention to what was written in first post. One sidebar after another of pseudo advice.. If support was not available, then your argument fails since this URL proves HP still offers web page support. @84B23F, I guess I certainly started a Fire-storm. I appologize for the incorrect information that I posted previously. I had two pages open in my browser for two different computers and looked at the one that had Win 10 installed. This lead to my incorrect post. Now, the only explanation that I can come up with for your problem is, HP uses their motherboards in several different models of computers. They sometimes list BIOS updates for the other motherboards in the specifications (confusing!!). In your case, I am not certain that the BIOS update is for your motherboard. 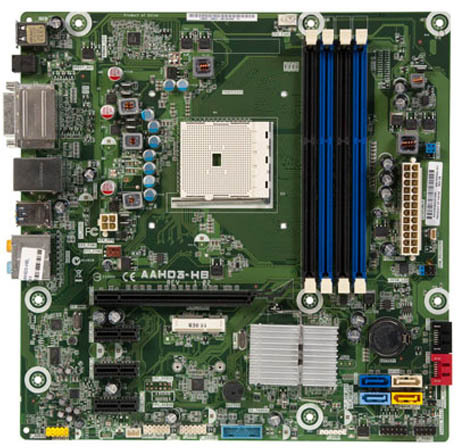 I can't find any information that shows your motherboard as being from the ROM Family 2ACF. This is normally in the Motherboard Specifications. Footnotes...in case others travel down this path. 1. BIOS ⁄ UEFI Firmware Support @ American Megatrends - Forget it...can't email them unless via bussiness email address. They are supporting their vendors, and have not setup a "Microsoft" type knowledge base. 2. HP Pavilion p6-2133w (Win7) - Several Google scans indicate this motherboard is related to Pegatron 2ACD, and not ROM Family 2ACF, as HP's driver/software support page suggests (see first post). At one site, they noted "Pegatron 2ACD (v1.01) Motherboard Support: Win 7, Vista/XP (32/64bit)"
3. sp69356.exe - This is HP's exe file to be execuated, and it is found at C:\SWSETUP when done. It contains drivers/pdfs, but most people would not be aware of its content. Nothing happens when upgrading BIOS/UEFI. 4. BIOS/UEFI - This may have been a first generation...I have two motherboards, one with 7.16, and one with an earlier version. I know version 7.07 existed. And in that post, it was indicated "Pegatron 2ACD Motherboard," which further suggests on HP's web site that ROM Family 2ACF is incorrect for this motherboard. 5. safuwin.exe - This is the flash program, "AMI Firmware Update Utility(APTIO) v2.38_HP_v03 | | Copyright (C)2011" This has been updated to "AMI Firmware Update Utility(APTIO) v2.38_HP_v04_B04." I noticed at one site, AMI APTIO firmware update utility. It works with all the motherboards designed by AMI and that have the newer UEFI BIOS." I haven't downloaded this updated utility. But, with safuwin.exe, I copied UEFI BIOS from one motherboard, and could not install it on another motherboard....both boards are identical. I thought about resetting the CMOS, and then try, and also thought about trying at DOS level...no Win7 running. Just ain't got the time now to fiddle. 6. d:\Flash>safuwin /clnevnlog - When I run this command in a DOS window, both motherboards get this result, "System BIOS image invalid or corrupt." Clnevnlog switch is suppose to "Clear Event Log" So, safuwin.exe may or may not be the correct flash program.